Autumn in Sydney brings us Broccoli, Pumpkin, Potatoes, Kiwi Fruit and Bok Choy. I like to eat seasonally when I can as it is lower in cost, tastier and has a much higher nutrient content as the produce is freshly picked and hasn’t had to travel as far. Here is an outline of the some of the ingredients and their nutritional benefits. Pumpkin originated in Mexico and Argentina which comes as no surprise as it’s a key ingredient in many South American and Central American dishes. It is also widely popular in the United States. Pumpkin is full of pectin, which is a high- quality fibre found in fruits and vegetables. This makes it a low GI vegetable which helps regulate our blood sugar and keeps us fuller for longer. Throughout its history, mushrooms have been used as a medicine for their nutritional benefits. They support our immune system and provide us with antioxidants. They are highly nutritious and have good sources of selenium, phosphorus, B2, B3, B6, vitamin B12, choline, and folate. Rosemary originated in the Mediterranean where it was used to stimulate and strengthen the memory, especially in ancient Greece where it was worn in hair before exams. Rosemary also has a history in English tradition as a sign of fidelity and was given as a gift for weddings. 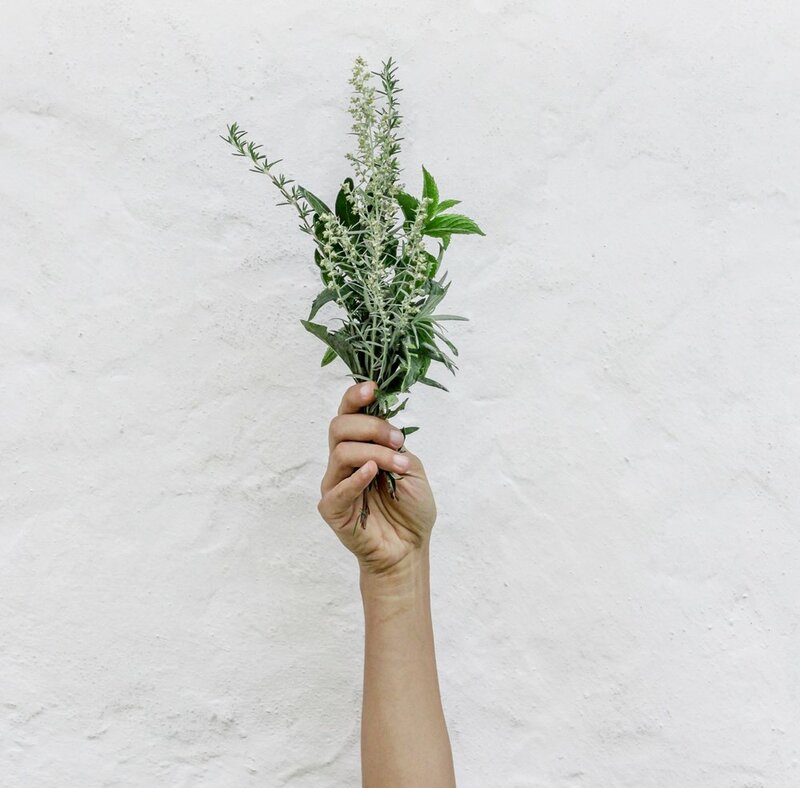 It was during the 16th and 17th century that its digestive benefits were discovered and now nutritional science has supported that rosemary supports our immune system, digestion, concentration and can even help with asthma. Garlic is a staple in most of our recipes and it has a rich history for its nutritional benefits. In ancient Egypt it was used to prevent infections and is documented for its use in Sanskrit and Chinese traditions. Louis Pasteur was one of the first scientists to confirm the antimicrobial properties of garlic. As well as its antimicrobial properties, garlic also reduces cholesterol levels, blood pressure and enhances our immune system which is why it is goof for colds and flu. Another staple in my recipes is Turmeric. Its history lies in India and Southeast Asia, where it has been used in cooking and for its therapeutic benefits for thousands of years, particularly in Ayurvedic medicine. Originally known for its detoxification and anti-inflammatory benefits, recent research has shown that turmeric assists with cognitive function, blood sugar balance, lupus nephritis, cancer, diabetes, irritable bowel syndrome and acne. Cinnamon is one of the oldest spices. Its history lies in ancient Egypt where it was used for fever and nausea and it was so highly cherished that it was deemed more treasurable than gold. Its other nutritional benefits include blood sugar control and improved brain function. It also has anti-clotting and antimicrobial actions. 1 tablespoon of coconut milk , cream or milk. Dice butternut pumpkin and put in mixing bowl with a tablespoon of olive oil/coconut oil, turmeric and cinnamon. Place in baking dish and bake in oven for 35 minutes at 180c. Whilst cooking, chop the zucchini, bok choy, mushrooms, onion and broccoli. In a pan, heat 1 tablespoon of butter/ghee and brown onion. After 2-3 minutes add in the remaining vegetables. In a separate pan, heat the other tablespoon of butter/ ghee and lightly brown the mince. Once lightly browned, combine the mince and vegetables. Add in the chopped tomatoes, one garlic clove, coconut amino’s, sumac, rosemary, paprika, fresh chopped mint, cumin, thyme, chilli, salt and pepper. The pumpkin should be nicely baked, take out of the oven and let it cool for a minute. In a mixing bowl, add in coconut milk/ cream/ milk, garlic, salt and pepper and the remaining cinnamon and turmeric, whisk until it becomes fluffy. In an oven proof dish, pour in the mince and vegetables and cover with the pumpkin until smooth. Sprinkle with more Himalayan salt. Bake in oven on a 175c for 30 minutes. Extra steamed vegetables or a fresh salad.